AFRICA/SÃO TOMÉ - The Bishop of São Tomé: "to fight poverty we must create development and give hope to the people"
The Bishop of São Tomé: "to fight poverty we must create development and give hope to the people"
São Tomé (Agenzia Fides) - "São Tomé and Principe is a small country, composed of two islands, located in the Gulf of Guinea, Gabon is the nearest nation. It is a typically tropical country with beaches, palm trees and lush green which covers its surface, while the turquoise sea surrounds the basaltic surface of the islands. It is, at the same time, a poor country, where resources are tourism (not yet very developed) and chocolate. Most of the population lives on public services and agricultural activities. It is an extremely young population, around 70% are under 30". With these essential connotations, His Exc. Mgr. Manuel António Santos CMF, Bishop of São Tomé, describes to Agenzia Fides the social and ecclesial reality of the territory. In these days, Cardinal Fernando Filoni, Prefect of the Congregation for the Evangelization of Peoples, is on a pastoral visit in São Tomé, after visiting Angola, to conclude the celebrations of the 50th anniversary of the Episcopal Conference (CEAST) which brings together the Bishops of the two Poruguese-speaking countries (see Fides, 9/11/2018). Former Portuguese colony, São Tomé gained independence in 1975. For 16 years it had a socialist regime with a Marxist tendency. In 1991 it adopted the regime of parties, in the style of Western democracies, in a semi-presidential system, with regular elections and alternating parties to the government. "The greatest drama for me - the Bishop continues - is the lack of hope that I see so often in people. Poverty seems almost insurmountable, since we do not see the prospect of a development of the country that would allow a decent life to the population. The budgets of the various governments have given as external aid about 90% of their income! It is necessary to concentrate on improving infrastructures, supplying drinking water and energy to the population, better sanitary conditions, schools, teacher training, etc. Despite all this, São Tomé is a country of warm and friendly people, who knew how to defend democracy and freedom reached in 1991 and with rare situations of violence". The diocese also has 5 indigenous diocesan priests and 22 major seminarians". 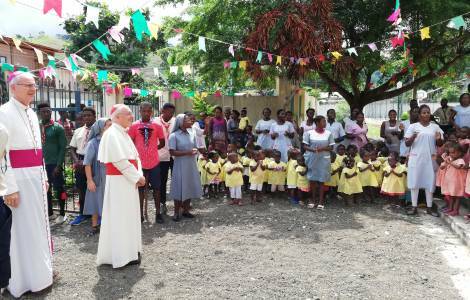 Faced with widespread poverty, "through Caritas, the Holy House of Mercy, parishes and religious Congregations, and with the help of lay volunteers, the Church is an effective presence among the most needy - says the Bishop -. We have above all tried to welcome children and the elderly, to help young people in their formation, to promote the dignity of women and to educate children and adolescents". Among the obstacles that the local Church finds itself having to face, Bishop Santos highlights the invasion of Pentecostal sects, which occurred in recent years, "which promise prosperity and liberation from all the evils, physical and spiritual and, above all, the defense against evil spirits and evil eye. It is the great drama of this people: the fear of plague, of the evil eye. A great effort was therefore made to concentrate on organized catechesis and youth and family pastoral care". The lack of material means also limits the action of the Church, which lives the same poverty of the population, as well as suffering the lack of credible leaders, accepted by the people, capable of assuming the responsibility of coordinating the sectors entrusted to them.